Belonging to Allan Kerr Taylor- a colonel in the British Army stationed in India, the Alberton started off a humble farm house that grew with the wealth of the owner. 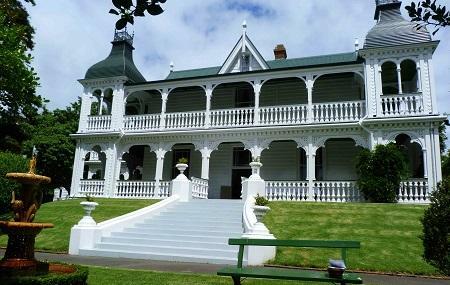 Currently the place offers a glimpse in the 1870’s Auckland. The 18 room mansion has Indian-themed rooms, vintage furniture, dinnerware and other historical artefacts that belonged to the Taylor family. The whole property gives you an impression that the place is still a functional house. The on ground gift shop and and store sells jewelry, decor items and souvenirs- perfect to remember the visit. Surcharges may apply at times of special events. People normally club together La Cigale French Market and Kiwi Valley Farm Park while planning their visit to Alberton. I had a wonderful time at Alberton House today for a personal project photo shoot. They were very welcoming. Beautifully preserved rooms under the care of passionate people. Highly recommend for personal project shoots and commercial. Thank you once again! Time machine to 19 century, 10$ admission fee for an adult, friendly lady gave us a wee tour around the house. Nice garden for a picnic under old trees. We've spent 2hr on the dot to cover all 18 rooms and outside area. We love going to the Alberton Summer markets. Such a beautiful atmosphere and you feel like you've left the city for a little while. Fabulous event. High quality stalls and performances. Looking forward to attending again soon.